Now that most of us have gotten through the business of back-to-school, it is time to look forward to fall weather and more indoor play time. With a small handful of exceptions, it is almost always the battery-free toys that keep our children entertained for long periods of time again and again. 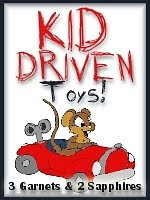 With these toys, my children are in control, so the play is always fun. These pieces from the Guidecraft wooden doll furniture collection offers endless hours of pretend play for one, two, or all three of our children at once. The Guidecraft doll furniture is available in two finishes . . . Espresso and Natural. 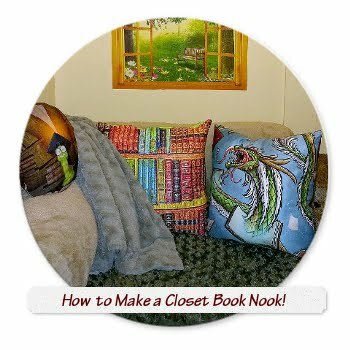 Depending on which room you visit in our home, either finish would have worked for us. Our living room has dark mission style furniture, but my daughter's bedroom furniture is more white and natural shaker. We opted for the natural wood doll furniture because we think ultimately these pieces would belong in our daughter's bedroom. 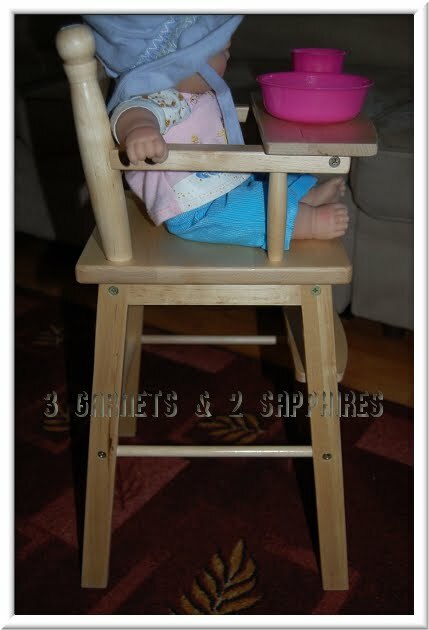 We received the doll high chair and the doll cradle to test out. I was so excited when these arrived because I had to disappoint my daughter by getting rid of her previous plastic high chair and low quality wooden doll bunkbed. Both were very unstable. If a child cannot even lean a little weight on a piece of toy furniture with their hand, then I consider it to be unsafe. It only took approximately 15 minutes for my husband to assemble both pieces of doll furniture. The cradle came with it's own tool, but you will need a Philips head screwdriver for the high chair. Both pieces were extremely sturdy and felt like real wood furniture (not to suggest that they be used for anything else other than pretend play with dolls). The only piece that was not screwed in was the footrest for the high chair. The chair is constructed so that the footrest cannot be removed, so it matters not that it wobbles a bit since it is just for show. At 24" high, this high chair for dolls is the perfect height for a preschooler. Our 3-1/2 year old daughter can feed her doll comfortable while she is both standing or sitting. This chair should fit a doll up to 21" tall. 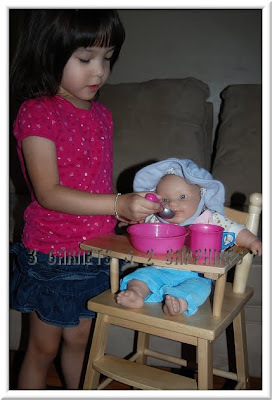 As you can see, a 14" doll is able to sit in the chair without falling or sliding down as well. Our daughter is very pleased that the tray is large enough to fit a bowl and a cup and then some. 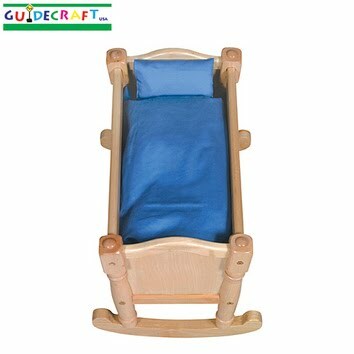 I chose the wooden doll cradle out of all the 3 types of doll beds offered by Guidecraft because it is the only one that is interactive. I thought my daughter would enjoy rocking her baby dolls to sleep rather than just tucking them in. 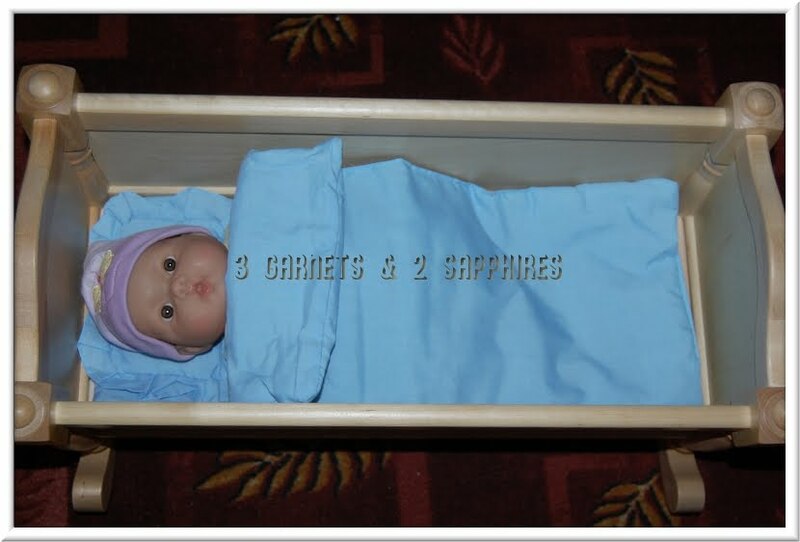 This cradle comes with a 3-piece bedding set, which includes a pad for the doll to sleep upon, a comforter, and a ruffled pillow. The color may vary because the bedding that accompanied our cradle is a lighter blue than the one shown on the website. Again, this piece of wood furniture is extremely solid and sturdy . 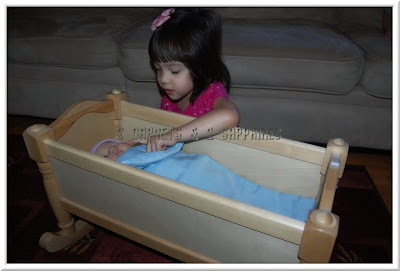 . . a toy that would probably last long enough for my daughter to pass onto her own little girl someday. 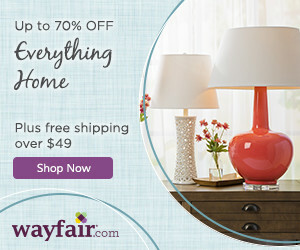 To view Guidecraft's full line of doll furniture, children's furniture, and toys, visit Guidecraft.com . 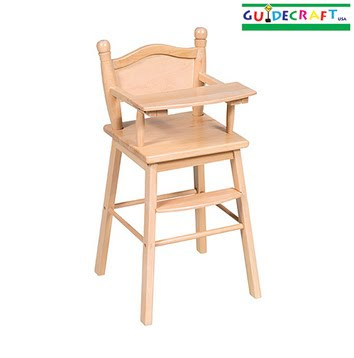 To find more reviews by moms like me about a variety of Guidecraft products, visit the Guidecraft.com Blog. 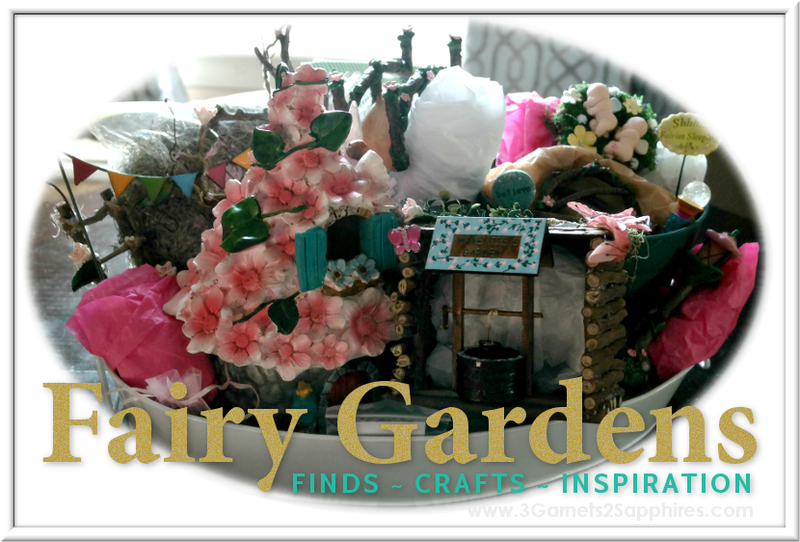 Thank you to Guidecraft for sending us sample toys free of charge to base this review upon and for providing additional toys for our contest prize. 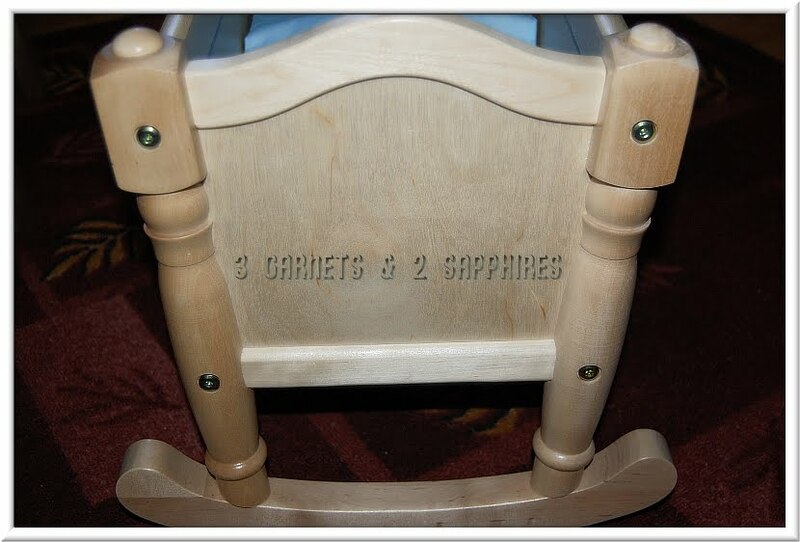 One lucky reader will receive a Wooden Doll Cradle and a High Chair in the Natural Finish (ARV $120). 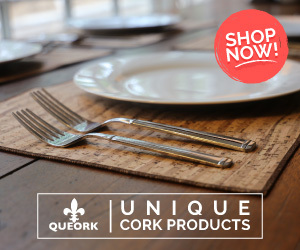 Browse the selection of products offered by Guidecraft. Then leave a comment telling me the name of one item you know would put a smile on a child's face this Holiday season. You MUST do this to be eligible to win this contest. 3) For 10 extra entries, sign up for the Guidecraft E-Newsletter (at the bottom of the page). Then come back here and leave TEN separate comments telling me you did so. 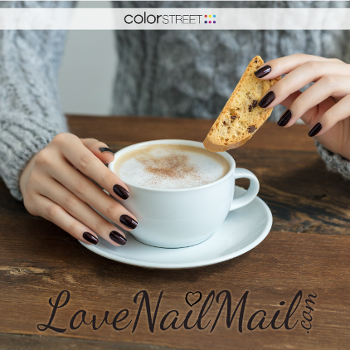 If you use a different email than the one you are using to enter this contest, then please include it in your entry. I will be verifying these entries.